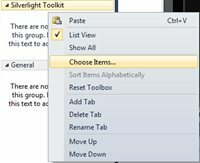 If you wish to drag and drop the Silverlight Toolkit for Windows Phone to the Windows Phone App , you should first add the the Silverlight Toolkit Controls to Visual Studio 2010 Toolbox . 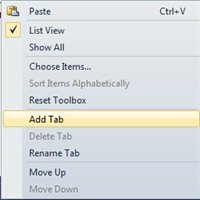 By Default , the Silverlight toolkit controls are not added to the Visual Studio toolbox and hence one should add the reference to the Microsoft.Phone.Controls.Toolkit.dll . 1. Open the existing Windows Phone Project or Create a new one and make sure that the .xaml page is the active window . 3. Right Click on the newly created Tab and click “Choose Items…” . 4. Select the controls from the Namespace “Microsoft.Phone.Controls” . If you are not sure of which controls to choose , click the “Browse Button” and select the Microsoft.Phone.Controls.Toolkit.dll . This can be found in the path : “C:Program Files (x86)Microsoft SDKsWindows Phonev7.1ToolkitAug11Bin” in 64bit machine . 5. This will highlight the controls in the Windows Phone Silverlight Toolkit , now just select or check one of the controls from the highlighted “Silverlight Toolkit for Windows Phone” and click ok.